At first I thought this mountain valley hike would become the most dull and grey one, but it turned out absolutely magnificent! 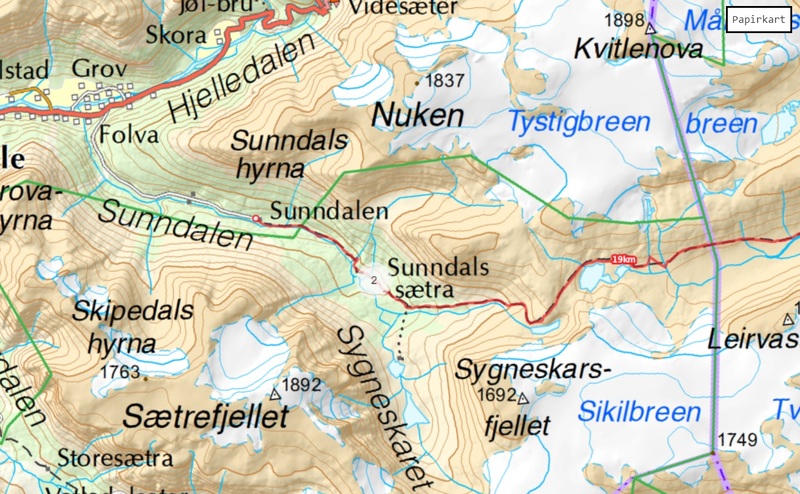 It would also be my very last hike in the spectacular Jostedalsbreen National Park and Stryn area before I leaving for next work and new outdoor adventures . I only met 2 hikers on this trail, so it’s a perfect hike for those who want to feel nearness to nature in peaceful, beautiful environments. The weather started out grey with some rain drops now and then, and I admit – it was bit tempting to stay in the cosy cabin to do some extra work on my laptop, but it was a day off so I wanted to just get out..and up! It started as usual with a bicycle trip from the farm cabin in Oppstryn and around the end of Oppstrynsvatnet lake towards Hjelledalen, where I at Folva took off to Sunndalen mountain valley on a gravel road leading through a goat farm..
You will pass PineGuri-steinen – the legend tells that 2 of the 3 young sheperdess died of starvation, fatigue and coldness after crossing the mountains, one of them died here at this stone. After a couple of km I parked my bicycle by a tree to hike the rest of the road and then on the marked trail. The goal was the mountain pasture Sunndalssætra, and all the way up I would be accompanied by the beautiful river Sunndøla all the way up to the magnificent waterfall Tverrelvfossen. Tverrelvfossen it a very photogenic waterfall, especially during the melting period – looks like a bridal veil fluttering in the wind. It is mostly an easy trail, so this is a nice hike for families too. 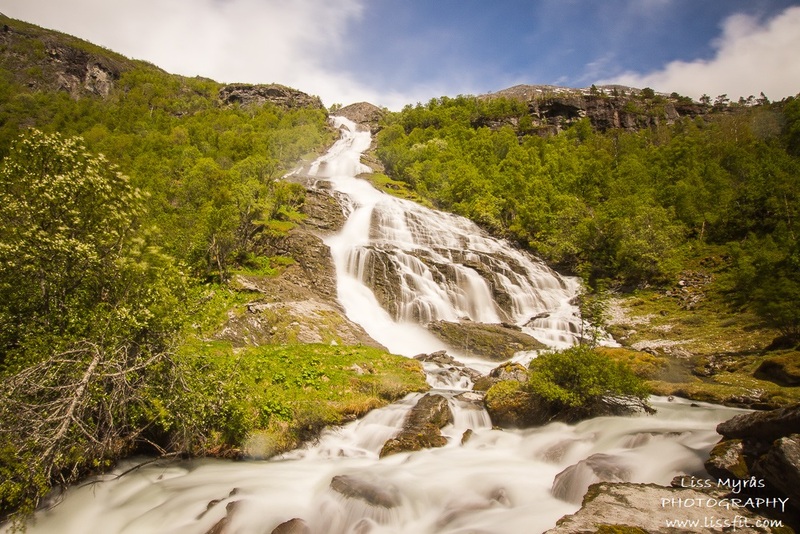 You will pass a bit of history (PineGuri-steinen), beautiful lush nature, the magnificent waterfall Tverrelvfossen …and of course enjoy your packed lunch at the old mountain pasture Sunndalssetra (depopulated due to frequent rock slides in the older days). There is an available outhouse there too, and also an abandoned lodge house. If you are up to longer and tougher hikes for days this old (but restored) trail continues and will take you over the mountain passing Kamperhamrane, Skridulaupbu to Skjåk or Grotli on the other side, old routes often used by drovers, shepherdess and traders back in the old days. (See this link for more information). Heja Myran, från Bäckby City Gym, jag blir bara mer och mer impad, av dig , vilken livsresa du håller på med, jag bara hoppas att du fortsätter och gör det du vill, så hjärte-gott! /Arne, alltid i VIK- hockeytröja, o välkommen till Hallstahr. Kram.